Fahrer, from Germany, is making interesting products from recycled materials. We look at the Spitzel handlebar phone mount and see if green is the way to go. Based in Berlin, Fahrer is making interesting bicycle accessories from a mixture of recycled materials, such as old innertubes and tarpaulins. Their products are designed for city use, but many of them are multi-discipline, like this Spitzel phone mount. It will fit a bike handlebar easily, but it might also fit a lawnmower, a fishing rod, or a pram. We’re not sure what a Venn diagram of those customers might look like, but it certainly makes the Spitzel a versatile mount, that’s for sure. Fahrer provide some other images which show the attachment system on their website. The plastic case that holds the phone seems fairly basic; just a budget black case moulded a million times in the Far East. The important bit is that Fahrer have stitched a Velcro patch to the rear. This then secures your handset to the mount, pre-attached to the bar. If you’re wondering whether you really want to stick your £500+ handset to your handlebars with just a strip of Velcro, I understand. I had the same concerns. To eleviate them, I attached the phone to the mount, but didn’t attach the mount to the bike. Instead, I spent several minutes shaking the mount as hard as i could. My ambition, to dislodge the phone and consider my concerns correct. After several arm-aching minutes, the phone hadn’t budged. The only thing left to do was take the Spitzel out on to the open road. After my in-house shaking, potholes proved no issue at all, and the phone was as secure as with most other cases we’ve tested. There is some movement of the phone and you rattle over rough roads, as the materials, mostly rubber, do have a little bit of play in them, but fears of a phone flying away and down a drain proved silly. There isn’t any weather protection on this model (although a waterproof case is available for some mobile phone shapes) so it was dry days only when we took it for testing. 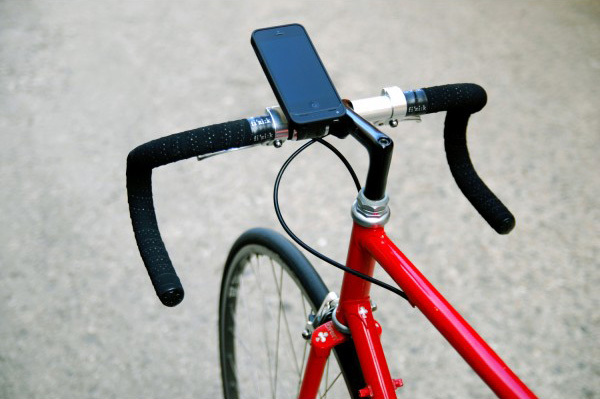 The phone ideally mounts on the handlebar, rather than the stem. At 55mm wide for the mount, plus an extra 10mm either side to accommodate the average smartphone, the 400mm handlebars on my road bike were lacking in width. Fitted to a hybrid bike, there was plenty of space for the Fahrer Spitzel, and it proved to be a simple and effective phone mount. As velcro is the main point of contact for the phone, it’s very quick to attach and remove. The base mount though, if left on the bike, could be stolen quite easily. There is no fiddly attaching mechanism to put off a thief, and it isn’t quite quick enough to encourage you to attach it before and remove it after every ride. There are cheaper phone mounts out there too, although they’re not quite like the Spitzel, you will have to pay a premium for the simplistic design and use of interesting materials. For more information visit the Fahrer website. A simple mount to operate, which attaches a phone safely and remarkably easily. It lacks any theft defence though, and it's competing with cheaper competition.